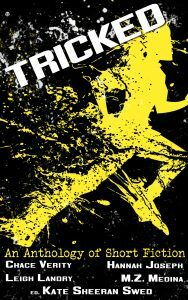 TRICKED: AN ANTHOLOGY OF SHORT FICTION will be available October 12th! An adult anthology of 5 stories featuring trickster themes, each loaded to the brim with conspiracies, scoundrels, and plot twists galore. A jilted silent film star plans a revenge heist with the unscrupulous childhood friend he always found rather handsome. A bank tycoon’s son plans to run off with Daddy’s money–and maybe his florist. To discourage a fae’s pursuit of her sister, a young woman writes awful fake love messages she delivers in person. To win a contest, a Frog Town Tavern waitress convinces her coworker to take her frogging. And in the far reaches of space, a Supreme Galactic Emperor takes on an ambitious building project under dubious circumstances. From the mansions of Tinseltown to the outer limits of the galaxy, these diverse stories have one message in common: in their world, it’s either trick—or be tricked. All proceeds from anthology sales will be donated to Food for the Hungry.